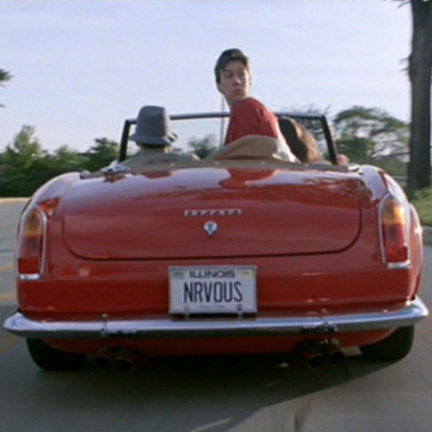 This prop license plate was used in the classic 1986 motion picture "Ferris Bueller's Day Off" directed by John Hughes. 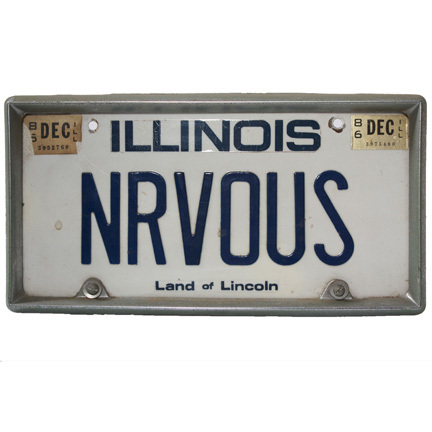 The prop was custom made for use on the production and resembles an actual legal Illinois state vanity license plate that reads "NRVOUS." 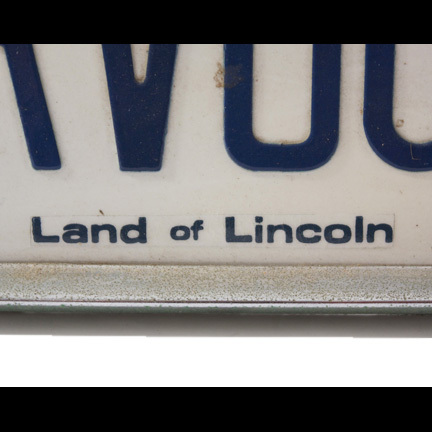 The upper corners have faux Dec. 1986 registration tags and the bottom of the plate has the Illinois "Land of Lincoln" slogan. 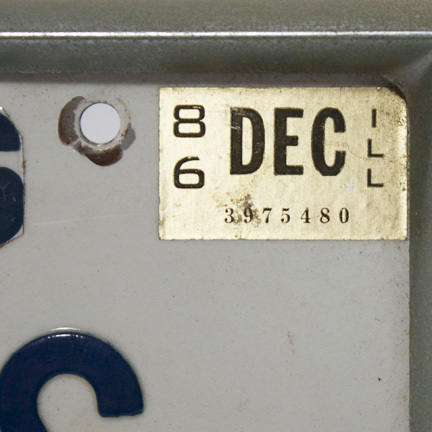 The license is mounted in the original steel frame. 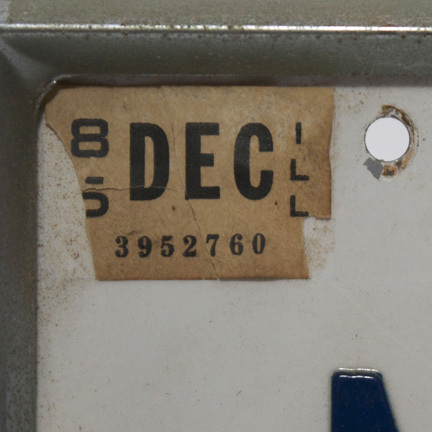 This plate is one of only four that were used on the production and was removed and re-attached to different versions of the 1961 Ferrari 250 GT California (actually a modified MG sports car) used throughout filming. The license plate can be seen in numerous notable scenes affixed to the back of the vehicle, and was a key element in the film's storyline. 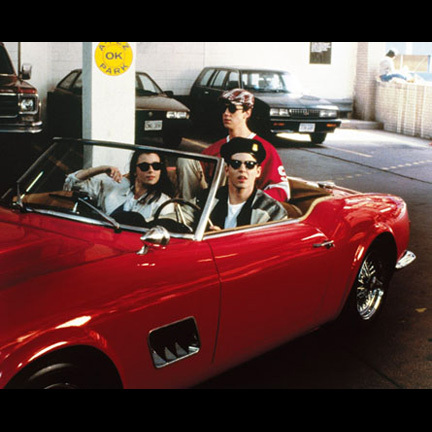 Early in the film, Ferris (Matthew Broderick) convinces his friend Cameron (Alan Ruck) that they have no choice but to borrow Cameron's father's car in order to pick up Ferris' girlfriend up from school. 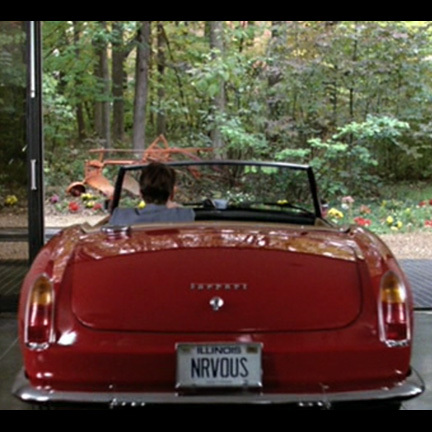 The plate is first seen onscreen when Ferris drives it out of the garage despite his friend's protests. The plate is again seen when Ferris and his friends drive around while ditching school, when the two parking lot employees take the car out for a joy ride, and most clearly at the end of the film when Cameron leans against the front of the running vehicle after kicking it and accidentally knocks it off of the jack, sending it smashing through the rear of the elevated garage into the trees below. This is the exact plate that was used in this climactic scene where the car was destroyed. 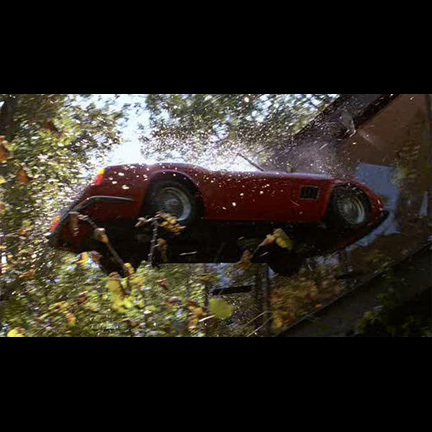 The plate was barely hanging on by a bolt after the crash sequence was filmed, at which point one the filmï¿½s property masters removed it and retained it in his personal possession. 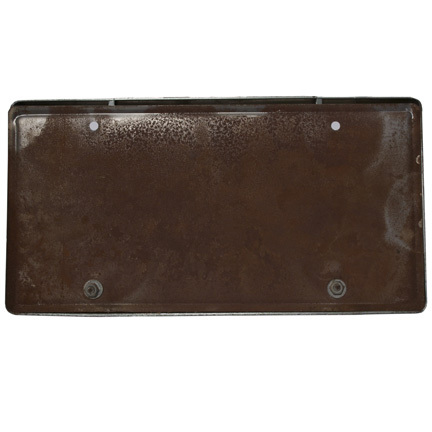 The plate is in good screen used condition with some minor evidence of age and oxidation on the steel frame. Accompanied by a letter of authenticity from the film's assistant property master. "Ferris Bueller's Day Off" is one of the most iconic films produced in the 1980's and remains one of director John Hughes' most beloved films to date. Actor Matthew Broderick received a 1987 Golden Globe nomination for Best Performance by an Actor in a Motion Picture Comedy / Musical for his work on the film.